There are not many protocols to chose from. From a performance perspective Ethernet wins hands down. It is also inexpensive to buy hubs to distribute the signals. It also has the lowest delay of the signals. However, it is the most difficult to work with for a hobbyist. The first protocol for controlling lights was DMX, where the lights for the stage were remotely controlled through a light board. 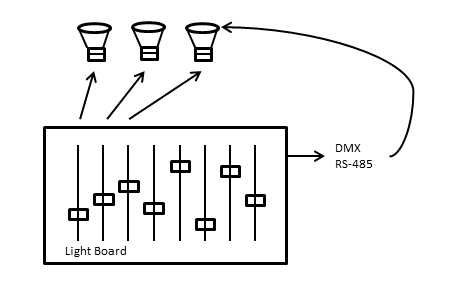 DMX is the standard industrial lighting designed for professional lighting. This is the standard that most of the lighting is based upon. This is similar to an asynchronous communication, but different timing to start the sequence. Once the start sequence has been sent the data is standard asynchronous format with 8 data bits, and 2 stop bits. The standard uses differential RS-485 to send the data. This format allows for a signal transmitter to send data to multiple receivers, nominally 32. The last receiver in the line should terminate the signal with 120 ohms. DMX defines a universe as 512 channels of data, where each channel can control the brightness (0 to 255) of one light. For RGB LED’s, this requires 3 channels to control the light. ACN/E1.31 is the main protocol used for Ethernet and most software supports the format. The data is output as multicast UDP packets. Which basically means that the data is just sent out on the network with no response expected. 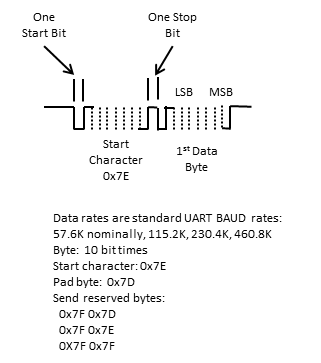 The standard has over 100 bytes of overhead on each packet, so it is not the most efficient. There is only one packet type defined for this protocol. This protocol is better for hobbyist’s, since you only need to listen to the messages on the network, without providing a response. There is also an additional output type used for Ethernet called Unicast, where the UDP packets are sent to a defined IP address. Unicast became popular since the Wiznet Ethernet adapter can not support more than 8 IP addresses, thus limiting the number of universes. Unicast also reduces the amount of traffic on your home network. However, it is recommended that you use a separate network for your light show. Art Net protocol is not as popular. This protocol requires communication between the controller and the computer. There are multiple types of messages, which is more work to communicate with the lights. Check with both your software and controllers to ensure that support of this protocol is available. Pixel net is a one megabit RS-485 communication bus. The protocol is extremely simple, there is a 170 decimal start character, which is followed by 4096 bytes of channel data. Any data that has a value of 170 is changed to 171. The information is sent as asynchronously with 8 bits of data and one stop bit. This protocol is very simple and allows the hobbyist to experiment. This protocol requires two conversions of data, once from Ethernet to PixelNet, and then again to the pixel type which increases latency. Renard is basically a asynchronous serial format with eight data bits and one stop bit. This protocol has three reserved characters. 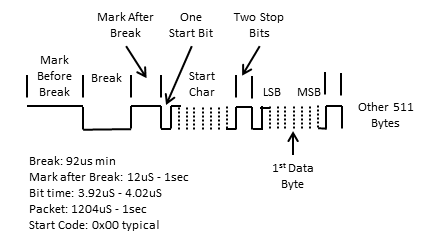 The start byte is 0x7E, which indicates the start of data. There is a pad byte that is ignored with a value of 0x7D, and finally 0x7F is used to send these three reserved bytes as two bytes of data. 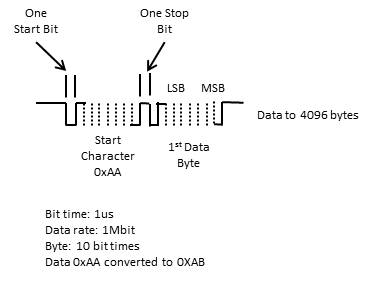 Many of the controllers will only transmit the 0x7E as a start character and then translate the three bytes to the nearest one byte value (for example 0x80). This data can either be sent as UART data using RS-232 levels, single ended or as differential RS-485. If you want the best performance Ethernet wins hands down. However, if you want to tinker with your lights the serial port is the way to go. I have seen eight port serial ports for a reasonable cost. Then you can take your small processor boards and convert the serial stream into lighting commands. My controllers support both serial and pixel outputs, so they provide the best of both worlds for a reasonable price.